Compiled by our Comms team and our Tech team, this page covers information pertinent on delegate performance, including UNA-USA procedure, delegate training videos, and other helpful information. All delegates, especially those who are newer to Model UN, are encouraged to review these materials to understand chair and general committee expectations and procedures. Please direct all questions to dg.committees@ymun.org. The official YMUN Online Training program is now available! All delegates, experienced and novice, are invited to learn more about MUN procedure and prepare for the conference through a variety of lessons taught by our very own YMUN XLV Secretariat. This is completely optional for your students and is offered free of charge. Please find our training program here. 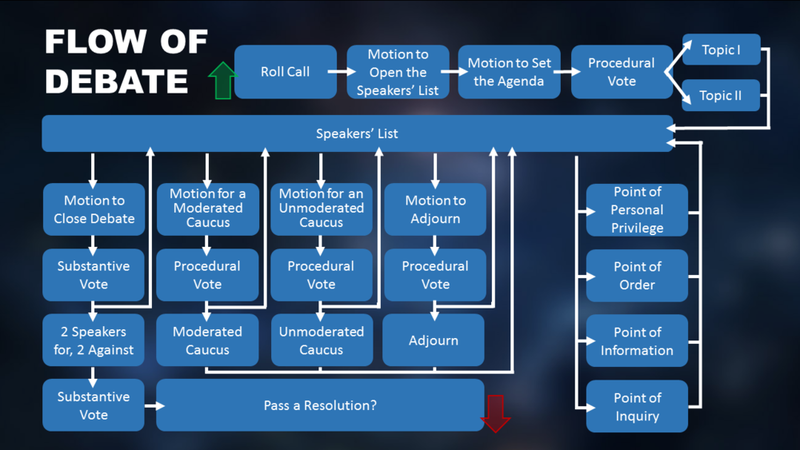 Click the button below for an expanded version of the UNA-USA procedure map, which breaks down the types of motions, order of caucuses, and general committee procedure. Click the button below for a description of committee flow at YMUN 45, and the specifics of UNA-USA Procedure. Delegates, for your convenience, here is YMUN 45's quick and easy-to-reference table of all available points and motions. Click the button below to access.